Back of Beyond Books and Walkabout Books have combined to create a catalogue of Our National Parks. Books, Photographs, and Ephemera. This is a perfect time to appreciate these national treasures, access to many just having been restored after a 35-day shutdown. Hopefully, this signals a permanent end to such nonsense. 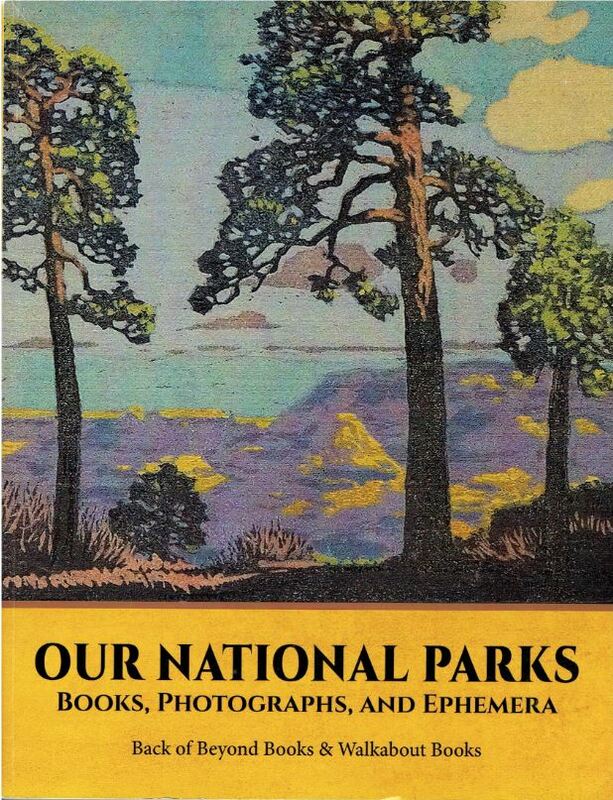 This is a collection of over 300 items pertaining to America's national parks. Many relate to these places from the days before they became national parks. We mostly associate America's national parks with the West, but they stretch from coast to coast and beyond. In here we find material with the same broad stretch, ranging all the way from Hawaii to the Virgin Islands. Some of these parks will be somewhat obscure to many readers, while others, such as Grand Canyon, Yellowstone, and Yosemite, are familiar to all. These are a few of the items you will find in this joint presentation. We start with a report on an early expedition into one of the more foreboding regions of the United States. Item 16 is the Report of the Exploring Expedition from Santa Fe, New Mexico, to the Junction of the Grand and Green Rivers of the Great Colorado of the West in 1859... It would be another century before some of this region was finally explored. The authors were the commander Capt. John N. Macomb and geologist J. S. Newberry. Their report was not published until 1876, a result of the intervening Civil War. Newberry had served on the Ives expedition the prior year, the first to descend to the floor of the Grand Canyon. The plan was to find a military route to Utah following the Old Spanish Trail. However, the difficulty of traversing desert territory became far worse in Utah, where deep canyons make travel extremely difficult. The report includes one of the best maps of its day. Still, based on the report, it is unlikely that the explorers ever made it to the confluence of the Grand (now Colorado) and Green Rivers. It is located in a remote part of today's Canyonlands National Park. Priced at $925. A half century after Ives descent into the Grand Canyon, O. K. Parker attempted the same. Technology had advanced enormously, and yet this was still a perilous journey. Parker's trip was made by automobile. Cars in 1911 were still quite primitive, roads in this area nonexistent. Parker was the Chief Engineer of the Automobile Club of Southern California. His book is A Strenuous Trip into the Grand Canyon of Arizona. Parker notes that "it took nerve and great courage to force an automobile over a route apparently impassable, seldom undertaken even on mountain trained saddle horses..." The book contains 11 full-page photographs to document this claim. It explains the purpose of this trip "was to consider the possibility of constructing a good road for motorists down to the very bottom of the Grand Canyon Gorge, to be a side trip on the Santa Fe - Needles National Highway." By 1913, when this book was published, Parker had hooked on with civic promoters from Needles, California, on building a route roughly along part of the old Santa Fe trail from Santa Fe to California, and easterly over Raton pass and on to Kansas, Missouri, and eventually the east coast. This account was published by the Franklin Automobile Company of Syracuse. Porter drove a Franklin, which he praises lavishly. Franklin promoted such challenging automobile trips in this era to show how good their cars were, and one suspects they helped Porter with his expenses. Franklin went out of business in 1934. Item 128. $200. They don't call it "Death Valley" for nothing. With temperatures that have reached as high as 134 degrees, you don't want to get caught there in summer without a lot of water. Unfortunately, some have. Item 35 is Death Valley's Victims - A Descriptive Chronology 1849-1966, by Daniel Cronkhite, published in 1968. As the dust jacket explains, "This data is not intended to be saturated with gory detail, depicting the death throes of physical demise without water. However, certain portions may be considered unpleasant by some, but then dying under a summer sun is not a pleasant ordeal." No it isn't. This copy is signed by "Sagebrush Dan" Cronkhite. $68. Here is an alternative to dying under the summer sun of Death Valley. You could try climbing the highest mountain in Alaska in the middle of winter. That is what one group of climbers whose thought processes escape me did. Item 44 is their 1969 account by Art Davidson, Minus 148 Degrees, the Winter Ascent of Mt. McKinley. I don't think it actually got that cold; that is probably a wind chill. Either way, that can kill you in a hurry. One of the climbers fell to his death, and three others were forced to hold out without their tents for six days in raging winds and whiteout conditions at 18,200 feet. I have no idea why they did this, and "because it's there" is not a good answer. $75. This next book is one of the earliest looks at Yosemite National Park, long before it was a national park. Item 272 is Yosemite Book - A Description of the Yosemite Valley and the Adjacent Region of the Sierra Nevada, and of the Big Trees of California, by Josiah D. Whitney. The author was California's first state geologist, for whom Mt. Whitney is named. However, what is even more enticing about this version of the book (the other had no pictures) are the mounted photographs within. Twenty-four were taken by Carleton E. Watkins, who accompanied the Geological Survey to Yosemite in 1866, the other four by William Harris in 1867. The book was printed in 250 copies, requiring Watkins and his staff to produce and mount 7,000 photographs. These photographs were instrumental in convincing Congress that Yosemite needed to be protected. $17,500. This one takes us to the other side of the country. It is a photo album from a CCC camp (Civilian Conservation Corp) during the 1930s. The CCC was created to provide public service employment during the Depression. The photographs were taken by Ludger Doucette, who was stationed at the camp in Bar Harbor, Maine. About two-thirds of the album is devoted to work performed in Acadia National Park. It was one of the first CCC camps as well as one of the few to stay open through the entire existence of the program. The CCC workers created the park's two campgrounds, cleared dead and diseased wood, created trails, built bridges and walkways, and cut and laid by hand granite blocks weighing over a ton. Much of what they created is still being used and enjoyed today. Item 2. $1,275. Here is another photo album, and one that will appeal to anyone who loves road trips. It documents a cross country automobile trip by the Laun family in 1936. They left from Waterbury, Connecticut, in June and were gone almost two months. They made it all the way to the three U.S. Pacific coast states and British Columbia north of the border. Among their stops were the national parks Bryce Canyon, Rocky Mountain, Zion, Grand Canyon, Yosemite, Sequoia, Glacier, Yellowstone, General Grant, and Canada's Banff. For those drawing a blank on General Grant National Park, its name was changed to Kings Canyon in 1940. Along with the photographs (129 of them) are some postcards, photocards, park entrance decals, a highway map, and a Conoco Touraide atlas with a route marked out especially for the Launs. Item 88. $545. Anyone interested in this catalogue or ordering from it should contact Back Of Beyond Books at 435-259-5154 or email raremoabbooks@yahoo.com.